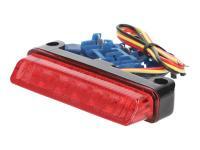 Mini LED rear light (rear brake light combination, brake light is brighter). Ideal for custom modifications on scooters, motorcycles and quads / ATVs range. Because of the small dimensions, the LED taillight is often used for off-road riding, where vibrations mean the taillight bulbs usually have a short life span. 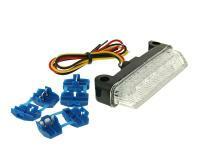 By using the 2 threaded mounting holes, the LED taillight can mounted fairly easily. Dimensions (HxWxD): 16x78x26mm. Hole spacing is 7cm, LED colour is red.